Enjoy your morning cup of coffee as you take in the spectacular views from the spacious deck of 'The TREE HOUSE' located near the peak of Screamer Mountain in Clayton, Georgia. 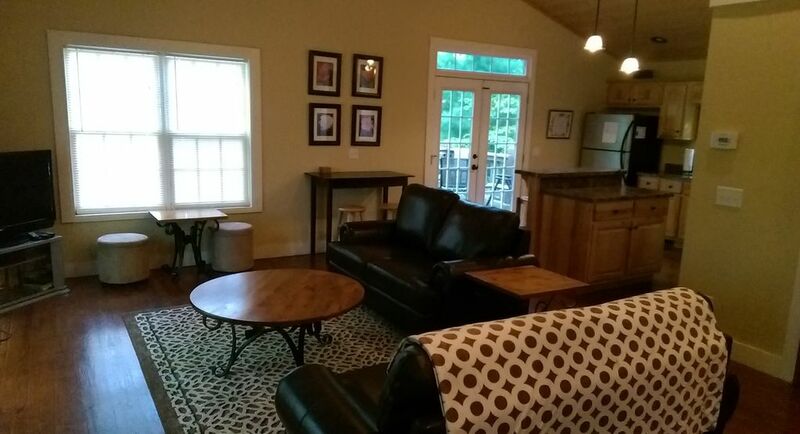 This cozy cottage is tastefully decorated and features stainless steel appliances, pine floor, knotted pine vaulted ceiling, tile baths, satellite TV(42' LCD flat panel), now with HD programming, Wi-Fi, a gas log fireplace, and lots of privacy! Hot tub has a lighted waterfall, plenty of cup holders and a great view. 6 PERSON!!! Great for a romantic get-away or a fun time with family. 'The Tree House' is one story, so you don't have to worry about little ones and stairs or lofts. We even have a pack-n-play for your little one, if needed. There are lots of fun things to do in Clayton and the surrounding areas as well as great places to eat! We have over 50 dvd movies available for your enjoyment as well as lots of paperback books. Enjoy steak or burgers from our gas grill. You can eat on the deck and enjoy the view from our patio table and chairs. In the evening, go outside and build a fire in our new fire pit area. You can enjoy the fire or go all out with some smores. No hidden fees when you rent The TREE HOUSE! I am a teacher in Gwinnett County and my wife works for a Publishing Company. We have 4 girls, 2 of which are adopted from China. One day my wife was driving back home from North Georgia. She was telling me how beautiful the drive was. I had already been looking at a website with listings in Clayton and showed her some pretty affordable homes. We have a friend who owns a cabin on Screamer Mountain who showed us some properties. When we walked out on the deck and looked at the view, we were hooked. We have fallen in love with our little house and the town of Clayton. We happened to be up there the weekend of the Christmas Parade this past winter. We so enjoyed the small town feel. Sunrises, walks, cooking out, breakfast at the Clayton Pharmacy, Pizza from Mama'Gs, are some of our favorite things to do. We also love Goats on the ROOF! You can rent a boat at Laprades marina, hike at Black Rock Mountain State park or Tallulah Falls State Park. The Dillard House is a short 15 minute drive away. 6 person hot tub. Great view!! Includes waterfall, cup holders, colored lights, plenty of jets!! Wonderful cabin with wonderful view! I have stayed in many cabins in North Georgia. This may have been the best! Every single amenity you could want was there. The cabin was clean and comfortable. Thanks for squeezing us in on such short notice. We loved your place! Great place that met all our needs. We mostly went for the hot tub. And it was just what we wanted! Was hot and ready to go on arrival; worked great throughout the stay; lovely view from the hot tub. We also enjoyed the gas logs. Bed was comfortable. Close drive to restaurants (I recommend Fortify pizza joint) and to Tallulah Gorge State Park. Check-in was easy, privacy was great...never had to talk to anyone. The fire pit was not an appealing part of the property, but we didn't need it, so weren't disappointed. This cabin is everything it's advertised to be and more. Super clean and amazing views! We will be back! This was a lovely house! We were up looking for a place to buy and stayed here for two days. The view was beautiful! It had everything we needed to eat in one of the nights. It was close to everything but you felt far away. The gas fireplace was great so we had a nice fire without dealing with wood inside. And the fire pit was fun as well. The topper was the hot tub on the deck! It was cool the first night but once we warmed it up it was hot the remaining stay. The owners directions clearly state what temperature to leave it on when departing but apparently the people before us did not read them or the cleaning folk turned it down because once it warmed it was perfect the rest of our stay! We would highly recommend this home and would stay again. Very secluded-located off the road and surrounded by hardwood trees. Great place to get away from everything, relax and get back to nature. We enjoyed the hot tub on the back deck overlooking the mountains. The gas log fireplace gave the place a romantic setting. Would definitely recommend. The only thing I didn’t find was a hair dryer. But then again I could just be spoiled from staying at hotels. The view from the deck was breathtaking! We loved our stay! The house is a perfect getaway!